Well, adding to Obama's extension of our military involvement in Afghanistan, there's now the promised-he-wouldn't introduction of American advisors (the technical term for first-into-the-war) in Syria, for reasons that aren't terribly clear. The future of the GOP primary debates appears sketchy. And the argument against the candidacy of Jeb! Bush appears to hang less and less on objections to American political dynasties, per se, and more on objections to American political dynasties that are plagued with generations of "daddy issues." But the main topic appears to be the man who, as Randle Patrick McMurphy might have put it, has nosed out The Short-Fingered Vulgarian as the bull goose loony in the Acute ward of the GOP psychiatric hospital. (He's also the one whose face has replaced Trump's as the most nearly omnipresent on my Facebook feed, a situation I'd love to see remedied at the earliest possible moment.) The trouble with Ben "Elmer Gantry" Carson is that he makes parody, satire, even ridicule, nearly pointless. There's little a cartoonist needs to do (or can do) beyond simply quoting the man, accurately and in context. I wonder how many of the Carson demo even know who Elmer Gantry is? Perhaps if we remade the film version (even with Kindle, no one's going to read Sinclair Lewis these days, dahlink), in 3-D, with Tatum Channing in the Burt Lancaster part. Today's toons were selected after a week of negotiations in a 67-degree Fahrenheit, multi-podium broadcast venue, from the week's offerings at McClatchy DC, Cartoon Movement, Go Comics, Politico's Cartoon Gallery, Daryl Cagle's Political Cartoons, About.com, and other fine sources of toony goodness. p3 Picks of the week: Mike Luckovich, Jeff Danziger, Tim Eagan, Dan Wasserman, Signe Wilkinson, Nick Anderson, Darrin Bell, Chris Britt, Pat Bagley, J. D. Crowe, Matt Wuerker, and Monte Wolverton. p3 Best of Show: Chan Lowe. p3 Legion of Merit: Ted Rall. p3 Award for Best Adaptation From Another Medium (tie): Nick Anderson, Marshall Ramsey, Phil Hands, and Jeff Danziger. p3 Good News/Bad News Award: Bob Englehardt. p3 World Toon Review: Patrick Chappatte (Switzerland) and Marian Kamensky (Austria). Ann Telnaes asks a pretty obvious question about borders made up out of nothing a century ago, although her headline writer has a somewhat odd sense of the word "predictable." Mark Fiore presents a new kind of debate for a new kind of candidate. Tom Tomorrow lets us watch as Second Amendment enthusiasts discover that the whole authority thing is trickier than it might appear. Keith Knight reveals something silly. Or allows something silly to reveal itself as such. Probably the latter. It's a Red Meat twofer: Bug-Eyed Earl is on the job, and Ted Johnson acknowledges some lingering concerns. The Comic Strip Curmudgeon considers you and I never have: the horrifying opposite of the face of a man engaging in a long-running, well-established B.C. gag. I joked above about how many Carson supporters do – or don't – know who Elmer Gantry is. Comic Strip of the Day reminds me that they probably don't know who Parson Weems is either. Hey, shrimp! Get an eyeful of this – here's some real window washing: "The Paneless Window Washer" was directed by Dave Fleischer in 1937, with animation by Willard Bowsky and the magnificently named Orestes Calpini. Uncredited: Jack Mercer (Popeye), Gus Wicke (Bluto), and Mae Questel (The Slender One), musical director Sammy Timberg, and scenic artist Anton Loeb, who created those lush (even in black and white) street fronts and building facades. 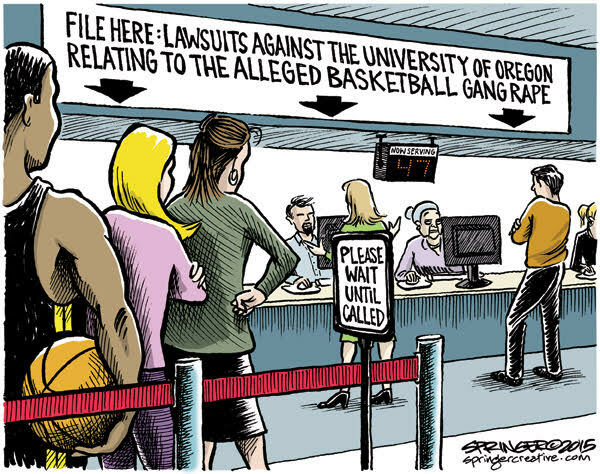 Ex-Oregonian Jack Ohman pretty much aggregates all the Ben Carson jokes out there to be made. 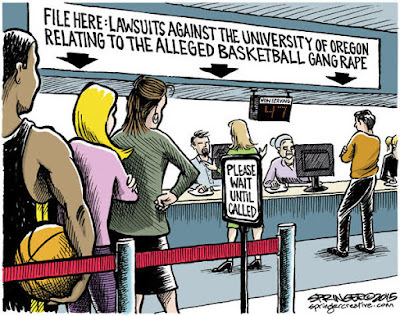 Possibly Ex-Oregonian Jen Sorensen introduces Arizona: the land of No return. Matt Bors looks forward to the next year. Test your toon captioning spells at The New Yorker's weekly caption-the-cartoon contest. (Rules here.) And you can browse The New Yorker's cartoon gallery here.